You are loading a toy dart gun, which has two settings, the more powerful with the spring compressed twice as far as the lower setting. 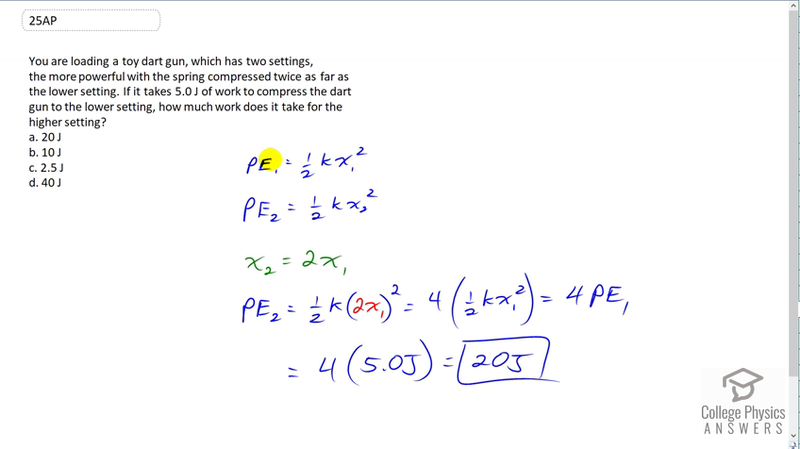 If it takes 5.0 J of work to compress the dart gun to the lower setting, how much work does it take for the higher setting? This is College Physics Answers with Shaun Dychko. We're going to compare the potential energies in the two settings for this toy dart gun. In the first case we have an amount of spring compression x one and so the potential energy one will be one half times the spring constant times x onesquared. Then, in the second case when you’re putting it under a more powerful setting, we'll call that potential energy two. That equals one half times the same spring constant k, multiplied by a different compression though, we'll call it x subscript two, squared. We're told that x two is two times x one. So the amount of compression in the more powerful setting is twice the compression in the less powerful setting. So we'll substitute two x one in place of x two and that we do here. So Pe two equals one half k times two x one squared. So this two x one is in brackets being squared and so we have to square each factor. So two squared makes four and then x one squared is written here. So this is four times one half k x one squared but this is Pe one. Now we're told that in the first case it takes five joules of work to compress the spring and so we can substitute five joules for Pe one and four times that is going to be potential energy two which is 20 joules. So the answer is A.